Non-federal actors—such as cities, states, corporations, religious organizations and universities—are gaining prominence in the international climate policy arena, in sync with the increasing scale of their commitments. At the recent Global Climate Action Summit in a span of just over 3 days regions, cities, business, investors and civil society announced over 500 commitments to reduce emissions. The revamped Non-state Actor Zone for Climate Action (NAZCA) Climate Action Portal, established in 2014 to track and report such commitments, has registered over 12,000 stakeholders—including more than 9,000 cities—with climate commitments. This surge in subnational action deserves attention. Cities, businesses and regional governments often have real potential to lower emissions and serve as early implementers of change and incubators for climate action. Moreover, they can be valuable partners in achieving or even exceeding national goals—something that will be necessary as current commitments under Paris are insufficient to keep warming under 2 degrees. All of this points to a need for a more robust understanding of how subnational actors can materially contribute to national climate goals. New research is beginning to do just that. America's Pledge has released a new report, Fulfilling America's Pledge, with analysis from WRI, University of Maryland, Rocky Mountain Institute and others that sheds new light on the impact subnational actors can have in the U.S. The results show a significant impact from current actions, as well as strong potential for increased policy adoption to further drive down emissions. Subnational actors have historically been left out of major national level research efforts and emissions models. It can be technically difficult to account for nested policies; businesses and cities may be acting within states that in turn have their own policies, leading to complex overlap issues (see figure below). Breaking with past studies, the analysis conducted for America's Pledge applies a methodological approach that draws on lessons and experience from existing international practices while applying new tools to aggregate current actions from states, cities and businesses. The approach was informed by guidance developed by the Initiative for Climate Action Transparency (ICAT) and utilized policy and activity data from NREL, EIA, EPA and partner organizations such as CDP and ACEEE. 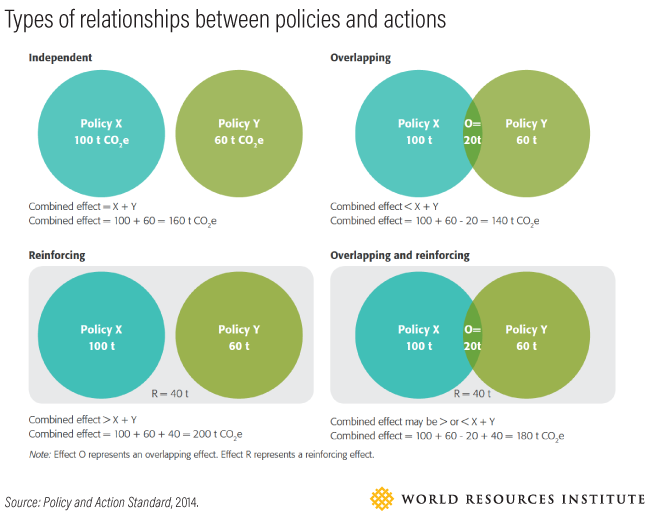 To aggregate this data, WRI developed a novel tool, WRI-ATHENA, that measures projected impacts and incorporates explicit assumptions about how state, city and business actions may overlap within various sectors of the economy and emissions sources. This approach allowed for the estimation of the aggregated impact of individual actions within various policy sectors (e.g. renewables, efficiency, HFC reduction, carbon pricing). These sector-specific results were then incorporated into an integrated assessment model, GCAM-USA, to account for additional overlaps and depict national, economy-wide emissions reduction implications. A further distinguishing factor of the analysis is that emissions trajectories were modeled in three scenarios: a current measures scenario representing already on-the-books policies from states, cities, and businesses; a climate action strategies scenario showing the potential impact of the adoption of near-term, feasible actions (e.g. extending renewables standards set to expire in the coming years); and an enhanced engagement scenario, whereby an even broader set of subnational actors takes advantage of existing technologies and proven policies and programs to lower emissions. The results also complement a recent study produced by Yale, PBL-Netherlands and New Climate Institute, which assesses the emissions reduction implications of subnational commitments across several high-emitting countries. The global study assesses a specific type of subnational and non-state action (greenhouse gas reduction commitments reported through open, voluntary platforms). The America's Pledge analysis is, by contrast, U.S.-specific and assesses a set of policy actions in multiple economic sectors. More than a novelty in the realm of climate policy research, these studies represent important test cases as the field of subnational and non-state policy assessment continues to develop. To facilitate broader engagement and develop universal best practices, organizations and researchers are invited to participate in the Initiative for Climate Action Transparency (ICAT) by piloting the ICAT guidance to assess the impacts of non-state and subnational policies and actions. Those interested in the assumptions relied upon for the America's Pledge analysis specifically may also view them in the report's technical appendix. Continued transparency and collaboration among researchers, policymakers, and local actors can result in more inclusive climate policy that achieves deeper emissions cuts. As more countries start to examine the potential of non-state and subnational action to achieve national climate goals, best practices and frameworks grounded in bottom-up analytics can help inform these efforts. Likewise, as groups of subnational and non-state actors continue to coordinate efforts to influence national governments and drive increased ambition, a clearer sense of their potential impacts will allow them to more concretely engage in policymaking processes. The America's Pledge methodology will be further discussed in an October 25, 2018 webinar.